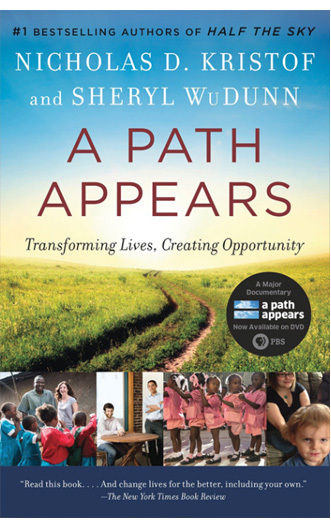 Nicholas Kristof and Sheryl WuDunn joined their work together again after the best-selling “Half the Sky: Turning Oppression Into Opportunity for Women Worldwide” in the new book and documentary film “A Path Appears”. The book gives an amazing narrative about how we can make things differently, while helping us to also become more responsible global citizens. The PBS documentary takes a closer look at the efforts of women in the United States and abroad, but also at the work of the inspiring individuals around them who are trying to create better solutions for them. Whereas in their popular New York best seller “Half the Sky”, the authors told us about the struggles of girls and women all over the world, in “A Path Appears”, they take it to another level and tell us about the people who develop strategies and come up with ingenious ideas to create a prettier world. The book has behind it lots of on-the-ground reporting and meticulous research and the authors manage to pinpoint how many of the global initiatives don’t fight inequality. They also estimate various forms of help and how important, for instance, early childhood education is. The analysis is based on the impressive stories that the authors tell from the frontline of social development. We’re able to see the reality that it takes the efforts of more than one to make a real difference in the world, but it all can begin from the will and power of each one of us. One man that really made a difference is Dr. Gary Slutkin who created the ‘Cure Violence’ program in order to fight inner-city violence in the United States by simply promoting the principles of public health. Another great man that we find about in the book is Lester Strong who got from high-powered television anchor to running an organization that involved senior Americans that became tutors in less privileged public schools. “A Path Appears” does highlight that it’s up to the citizens to turn the world around, whereas finding efficient solution for the serious social problems. No matter how painful and complex poverty may be, “the call to action doesn’t need to be” (Bill and Melinda Gates, co-chairs of the Bill and Melinda Gates Foundation). This books is honest and teaches us that everyone counts and we should all “raise the game and help the poor” (Bill Hybels, founding pastor, Willow Creek Community Church). The bold authors Nicholas Kristof and Sheryl WuDunn gathered an impressive team of famous actors to give a better voice to their book, “A Path Appears”. The movie features so many of our favorite actors: Eva Langoria, Malin Akerman, and Jennifer Garner, Blake Lively, Ashley Judd, Regina Hall, Ronan Farrow, Mia Farrow and Alfre Woodard, taking them all the way to Kenya, Haiti, and Columbia and within the United States. They are going to discover the most difficult forms of gender-based oppression and human rights violations, not without promoting the good solutions to combat them. The movie is in fact a three-part series that aired on PBS and the viewers have the opportunity to take a look at the gender inequality and causes of vulnerability all over the globe and within the United Stated. The series gives a deeper perspective over these major problems, but also shows the efficient methods to make a change. There are around 300,000 children at risk of being trafficked into sexual slavery in the U.S. (According to the Department of Justice) and the first episode shows us some of the survivors of sexual slavery, while highlighting the coverage of violent crime across America. It’s Ashley Judd and Nicholas Kristof that travel to Nashville where they sit and talk with Shana Goodwin, a survivor of early childhood sexual abuse (by her grandfather). Kristof takes Blake Lively on the streets of Boston to take a look at the anti-trafficking organization My Life My Choice. The movie tells bits of the stories of Maria’s daughter and Savannah that, one way or another, manages to survive the young sexual trafficking. The episode ends with a comeback to Nashville where the Magdelene program’s social business, Thistle Farms, sustains the efforts of survivors with full range of services needed for the healing. Jennifer Garner returns with Nicholas Kristof to her native West Virginia for paying a visit to the families included in Save the Children’s Early Steps program. The program is about introducing book and early learning to children fighting with poverty, but also offering emotional and social support to the mothers. The episode also takes us to Haiti, where Kristof, Sheryl WuDunn and Alfre Woodward meet Rea Dol, founder and leader of SOPUDEP ((Society of Providence United for the Economic Development of Pétion-Ville). The program provides education to children coming from the poorest background. Eva Langoria joins the authors and goes to Cartagena, Columbia and meet Catalina Escobar, founder and director of the Juan Felipe Gomez Escobar Foundation (“Juanfe”). The successful businesswoman Catalina (who lost tragically her son) developed the program addressed to pregnant teens and young mothers from local districts. Nicholas Kristof and Regina Hall go to Atlanta to take a closer look at two organizations finding solutions against domestic violence. They meet Ayonna Johnson at the Women’s Resource Center and we also find out about the survivors stories. Mia Farrow and Ronan Farrow go with Kristof to Kenya and visit Shining Hope for Communities, an organization that works for change in Kibera (which is one of the worst districts in Kenya). The movie shows us not only about the problems that poverty brings, but also about the efforts of organizations all over the world. The stories of the survivors do have the best voice, helping us all realize that it takes a village to raise a child and a community to make a change.